Most external hard drives are "functional, but" things. They're useful, but you wouldn't really call them stylish. The Freecom Hard Drive Sq is different though, with the name of the designer proudly displayed on the front of the box. It's reasonably small, sleek and good looking, and is a perfect example of the changing role of external hard drives. While they once hid behind our PCs, diligently backing up and storing our files, they can now be found in our living rooms, recording our TV shows. 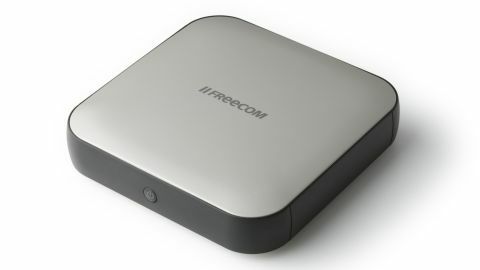 The Freecom Hard Drive Sq is a hard drive that can plug straight into a TV or set top box that supports straight to USB recording. Its prominent role in the house is reflected in the attention to design. If you don't have a compatible TV or set top box, the 2TB capacity and USB 3.0 compatibility makes this a great choice for more standard external drive tasks. You can also buy 1TB or 3TB versions, for about £90 (about $140) or £160 (about $250) , respectively. Overall this is a well-designed and fast external hard drive which looks great and works well. If you have a TV that supports recording straight to USB devices then the drive can also work as a PVR - definitely worth the money.